Whistleblowers can uncover these illegal schemes and receive a substantial financial reward if they are able to provide sufficient evidence. Call our attorneys now to receive a free legal consultation in full anonymity. A “kickback” is any gift, thing of value or compensation of any kind that is provided, directly or indirectly, to a primary contractor or subcontractor for the purposes of obtaining favorable treatment in the negotiation process. Kickbacks are usually given after a contract has been paid. Examples include meals, money, trips, souvenirs, gift certificates, and tickets to events. 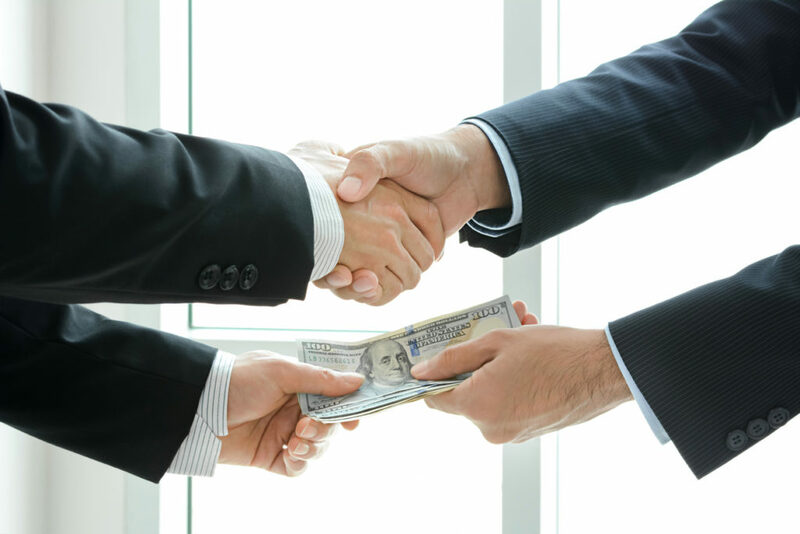 A “bribe” is an offer or promise to give anything of value to a current or former official for preferential treatment in the contracting process. They usually are given before a contract has been made or completed to “smooth out” the operations. Bribes can include discounts, entertainment, lodgings and meals, transportation, later reimbursement, or other items of value. Contractors that corrupt the contract procurement process harm the whole social fabric of the country. The result is that the government does not necessarily get the best deal possible.Bribers and dishonest government official will often try to have the government pay for the unlawful incentive by including it in the cost of the contract. The deception is hidden in goods or services that were never given to the authorities but were billed anyway, committing an additional fraud known as overbilling. All this contributes to the estimated $42 billion of taxpayer money wasted on contractor frauds. All those who participate in this form of illegal schemes, exploit the contract procurement system by benefiting themselves instead of the U.S. government and taxpayers. When contracts are not awarded to the best contractor suitable for the job, many small, veteran-owned, and legit American businesses fail to be promoted as they rightfully deserve. Who is Guilty of Contractor Frauds? A single entity can be guilty of this type of scheme. This occurs when the illicit payment is offered, but not accepted. However, if a person accepts a bribe or kickback, he or she is guilty along with the one that gave it. This does not have to be between a contractor and a government official. Subcontractors or those in relation with another primary contractor can also be complicit in the fraud. During the Cold War, the United States increased spending for the military and national defense. The U.S. authorities prioritized defense buildup, which came at the cost of oversight. More money meant more corporations able to manipulate the bidding process and defraud the taxpayers. By 1985, the four largest defense contractors working with the government had been convicted of fraud. Illicit payments are commonplace in the defense contract procurement process. In 2013, Kerry F. Khan, a program manager for the former Army Corps of Engineers, purposefully inflated billings and fake invoices by more than $30 million. Khan purposefully inflated the cost of the contracts by up to 100% so companies could provide him with kickbacks in exchange for successful agreements. At the time of his arrest, the man was working on a billion dollar negotiation. The former Army Corps official cheated taxpayers as he purchased mansions and luxury cars with his kickbacks. His downfall began when someone blew the whistle on a company that was financially related to a contractor providing fraudulent payments. The subsequent investigation was further aided by the cooperation of insiders in the companies. How Can You Detect Bribes or Kickbacks? Unusually friendly interaction between U.S. government employees and contractors. Unexplained increases in wealth for government officials. More middlemen or brokers are involved in contracts than necessary. Repeated selection of a particular contractor despite more viable vendors that could have competed for the contract. Unreasonable tolerance of a contractor’s late delivery, low-quality, or high-priced work. Unexplained or unaccounted for expenditures. The industry has a reputation for corruption. The supplier has an industry reputation for paying kickbacks. Payments to a government official or an account associated with them. If you have witnessed or participated in any potential illegal scheme as an insider, you can blow the whistle and report it to the authorities. If you possess privileged information or evidence such as documents that might prove the fraud, contact us now. Our lawyers and investigators will assist you during the whistleblowing process, until you secure your monetary reward.